DuPont Tychem F Hooded Coverall CHA5. Available in grey for discretionary needs, includes elasticated face, waist, wrists and ankles. Thumb loops prevent sleeves from riding up. Elasticated hood and self-adhesive chin flap for an excellent fit around a full face respirator. Zipper with self-adhesive double zip flap offering high level of protection and liquid barrier. Stitched and overtaped seams offering equal barrier as Tychem fabric. Elasticated on arm and leg closures ensure good fit and closure at critical points. Elasticated waist for optimum fit to body. Stretch rubber thumb loop attached to the end of the sleeve. Tychem Coverall Made from a lightweight and durable fabric (<500g per garment). Excellent chemical permeation protection, helping to protect personnel against numerous toxic industrial organic chemicals, highly concentrated inorganic chemicals (even under pressure), particulates, biohazards and certain chemical warfare agents. Material: Non-woven fabric + polymeric coating + barrier film + polymeric coating. Substrate in Tyvek® with laminated film, 120g/m2. DuPont Tychem F Hooded Coverall conforms to: Category III, Type 3-B, 4-B, 5-B and 6-B EN ISO 1149-5 EN 1073-2 EN 14126. 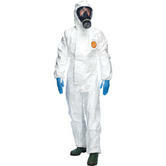 DuPont Tychem 4000 S Hooded Coverall available in white colour, includes elasticated face, waist, wrists and ankles. Tychem Coverall Made from a lightweight and durable fabric (<700g per garment). Excellent barrier to permeation by a broad range of inorganic and organic chemicals. Tychem 4000 is ideal for chemical handling, environmental clean-up operations and emergency response. DuPont Tychem 4000 S Hooded White Coverall conforms to: Cat. III, Type 3-B,4-B,5-B,6-B EN 1073-2, EN 14126 EN 1149-5. Available in bright yellow for high visibility, includes elasticated face, waist, wrists and ankles. Tychem Coverall Made from a lightweight and durable fabric (<450g per garment). Polymeric barrier coating is offering a good permeation barrier protection against a wide range of biological hazards and inorganic chemicals (even under pressure). Attached socks and boot flap. Materials: Tychem® F garments are made from a lightweight and durable fabric (500g per garment) consisting of a proprietary barrier film laminated to a heavy duty Tyvek® substrate. DuPont Tychem F Hooded Coverall CHA5 conforms to: Cat. III, Type 3-B,4-B,5-B,6-B EN 1073-2, EN 14126 EN 1149-5 standards. (PACK OF 5) DuPont Tychem C Hooded Coverall CHA5 PBS09DS, Available in bright yellow for high visibility, includes elasticated face, waist, wrists and ankles. Thumb loops prevent sleeves from riding up. Tychem Coverall Made from a lightweight and durable fabric (<450g per garment). Thanks to its nonwoven structure, it is permeable to both air and water vapour, yet repel water-based liquids and aerosols. Offers an excellent barrier against fine particles and fibres, is ultra-low linting and antistatically treated on the inside. Mainly composed of flash spun polyethylene, providing an ideal balance of protection, durability and comfort. DuPont Tyvek 500 HV Disposable Coverall conforms to: Category III, Type 5-B and 6-B; EN 14126; EN 1073-2; EN 1149-5; EN ISO 20471 Class-3. 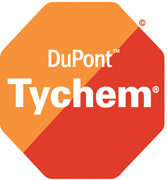 Tychem suits: made by Dupont, for over 30 years. These are the suit protection you need for chemical, biological and hazmat risks. The range of Tychem options can match and protect against the particular chemical risk you face. 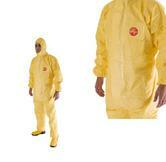 Tychem C suits, like the TyChem CHA5 are designed to meet Chemical protective coveralls, category 3 standard. They typically have double self-adhesive zipper flaps. TyChem F standard suits, such as Tychem Model CHA5 give you benzine and hydrocarbon protection.